Thanks to the Every Student Succeeds Act (ESSA), state leaders today have a rare opportunity to set schools on the right trajectory for years to come. The law gives those policy makers significant leeway to design school accountability systems that will work for students at all levels of achievement. This is welcome news because most state models need a total overhaul. Relics of the No Child Left Behind Era, they continue to judge schools based largely on the percentage of their students who attain the “proficient” mark on state tests. The signal those schools receive is that “bubble kids”—those performing just below or just above the “proficiency” line—are the students whose learning really matters. Indeed, research has demonstrated that students just below that bar were most likely to make large gains in the NCLB era, while high achievers made lesser improvements. The students most harmed by these perverse incentives are high-achieving, disadvantaged students who depend most heavily on the public education system to do right by them. Under today’s accountability regimes, their teachers often feel pressure to elevate their low achievers to pass state tests. And their schools face so many other challenges—attendance, discipline, nutrition, etc.—that attending to the educational needs of high achievers is apt to fall by the wayside. As we observe in our recent report High Stakes for High Achievers, one of the best ways states can right the course is by creating accountability systems in which growth for all students—not proficiency rates—is the primary focus. The good news is that most states today do use growth models, which measure the progress of individual students from one year to the next. 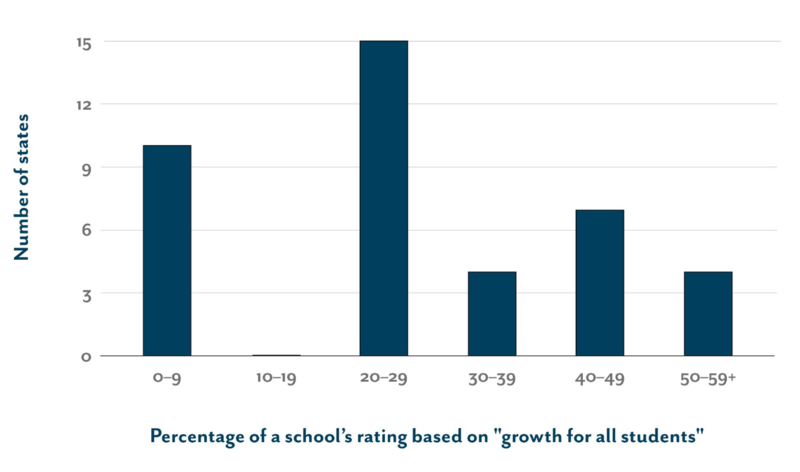 The bad news is that almost every state either (a) puts very little weight on the growth results when determining school grades or (b) only looks at the growth of low-performing students. Instead, the majority of states are basing most or all of their summative school ratings on proficiency rates, which are poor measures of school quality because they are so strongly correlated with student demographics and prior achievement. In other words, states have stuck with one of the worst aspects of the NCLB model. This is difficult to defend. The other pitfall is focusing exclusively on the growth of low-performing students as opposed to all students. At least a dozen states do this. Washington, for example, bases 60 percent of its grades on growth, but just half of that proportion comprises progress of all students. And South Dakota bases 40 percent of schools’ grades on a model that assigns significant weight to other growth measures (such as growth to proficiency) that exclude high achievers. In most places, the hard work is already done. Most states already have growth models; now they just need to make them count for the preponderance of schools’ grades. High-achieving students—especially those growing up in poverty—need all the attention they can get. They were an afterthought when No Child Left Behind was crafted fifteen years ago. Let’s not make the same mistake again. The country’s future economic competitiveness, scientific leadership, and national security may depend on it. This The High Flyer post is by Brandon Wright, editorial director of the Thomas B. Fordham Institute.